Sha'ab Sabina lies in the middle of the marine park where an extra 2 dollars has to be paid. It is worth the money as it is one of the best drift dives possible in this area. You will be literally floating across the best coral gardens available, diving up and down, left and right, not knowing where the current will eventually bring you. There are some shallow lagoons, coral covered pinnacles, small reef walls and photography is amazing because of the amount of light and white sand at the ocean floor. 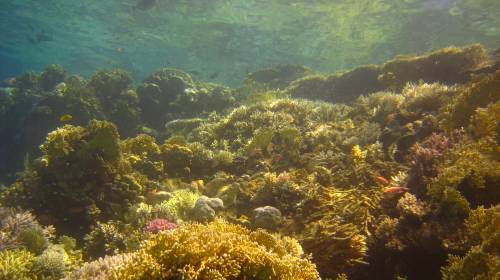 Some of the interesting species are gorgonians, giant clams, sea urchins, fire, table and brain coral. Enjoy this shallow but quite enjoyable drift dive.